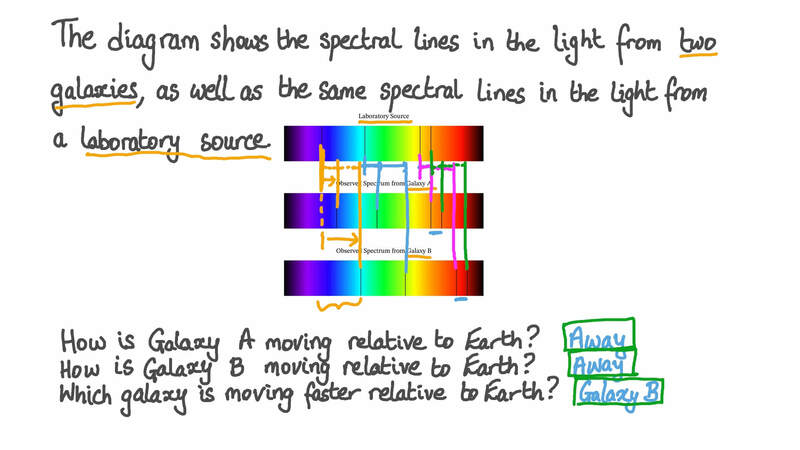 In this lesson, we will learn how to calculate the radial velocity of a star or galaxy using the amount by which absorption lines in the spectrum of light from it are shifted. The diagram shows the spectral lines in the light from two galaxies, as well as the same spectral lines in the light from a laboratory source. How is Galaxy A moving relative to Earth? AIt is moving toward Earth. BIt is moving away from Earth. CIt is stationary relative to Earth. How is Galaxy B moving relative to Earth? Which galaxy is moving faster relative to Earth? The diagram shows the absorption lines in a spectrum from a distant star compared to those in a spectrum from a laboratory sample. How is the star moving relative to Earth? AIt is moving away from Earth. BIt is moving toward Earth. An astronomer looks at the absorption lines in the spectrum of light coming from a distant galaxy. He identifies the absorption lines of hydrogen, which makes up most of the galaxy. He then compares these lines to the same absorption lines from a laboratory sample. His results are shown in the diagram. How is the galaxy moving in relation to Earth? The diagram shows the visible part of the electromagnetic spectrum. Some of the absorption lines of hydrogen are shown on the spectrum. What is the wavelength of the absorption line that has the shortest wavelength? What is the wavelength of the absorption line that has the longest wavelength? What is the wavelength of the absorption line that has the highest frequency? What is the wavelength of the absorption line that appears in the red part of the spectrum? The light emitted from two galaxies, A and B, is observed and the spectral lines in each are shifted toward the red end of the spectrum. Galaxy A is observed to have a greater redshift than Galaxy B. Which galaxy is moving faster away from Earth? The light received from very distant galaxies is shifted toward the red end of the spectrum. How are these galaxies moving in relation to Earth? AThey are moving toward Earth. BThey are moving away from Earth. CThey are stationary in relation to Earth. An astronomer looks at the spectrum of light coming from a distant star. He notices that the spectral lines in the spectrum have been shifted toward the blue end of the spectrum. Is the star moving toward or away from the astronomer? AThe star is moving away from the astronomer. BThe star is moving toward the astronomer. If a star or galaxy is moving very fast toward Earth, the wavelengths of light received from it will be , making the star or galaxy appear . If a star or galaxy is moving very fast away from Earth, the wavelengths of the light received from it will be , making the star or galaxy appear . The Andromeda galaxy is one of the galaxies closest to the Milky Way and has been observed to be moving toward it at a speed of 300 km/s. Light coming from Andromeda is therefore blueshifted. If light received at Earth from Andromeda has a frequency of 6 . 2 0 × 1 0 1 4 Hz, what was the frequency of the light when it was emitted from Andromeda? Use a value of 3 × 1 0 8 m/s for the speed of light. An absorption line normally at 552 nm appears at 585 nm in the spectrum of light coming from a galaxy. How fast is the galaxy moving away from Earth? Give your answer in kilometers per second and in scientific notation to 3 significant figures. The diagram shows some of the absorption lines for hydrogen in the electromagnetic spectrum. If a galaxy is moving away from Earth at a speed of 1 . 9 × 1 0 4 km/s, by how much would the absorption line with the shortest wavelength be redshifted? Use a value of 3 × 1 0 8 m/s for the speed of light. Give your answer to the nearest nanometer. The galaxy NGC 4945 is approximately 11.7 million light-years away from Earth and is moving away from it at a speed of 563 km/s. By how much is the 656 nm absorption line of hydrogen redshifted by this relative motion? Use a value of 3 × 1 0 / 8 m s for the speed of light. Give your answer in nanometers to 3 significant figures. An astronomer on Earth looks at the light coming from a distant galaxy. He sees that the 486 nm absorption line for hydrogen has been redshifted by 20 nm. How fast is the galaxy moving away from Earth? Use a value of 3 × 1 0 8 m/s for the speed of light. Give your answer in scientific notation to 3 significant figures. Light with a frequency of 4 . 6 × 1 0 1 4 Hz is emitted from a galaxy. When it is received at Earth, the frequency of the light has been reduced by 2 . 0 × 1 0 1 3 Hz. How fast is the galaxy receding away from Earth? Use a value of 3 × 1 0 8 m/s for the speed of light. Give your answer in kilometers per second and use scientific notation to 2 significant figures. A very distant galaxy is moving away from Earth at a speed of 1 . 8 × 1 0 / 4 k m s . Hydrogen within the galaxy absorbs light that has a wavelength of 410 nm, creating an absorption line in the spectrum of light from the galaxy. At what wavelength of light does this absorption line appear when the light reaches Earth? Use a value of 3 × 1 0 / 8 m s for the speed of light, and give your answer to the nearest nanometer.